Matt Garza just no-hit the Detroit Tigers in front a thrilled home faithful. 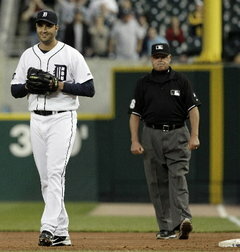 There was another interesting spectator, a member of the Detroit Tigers: Armando Galarraga. As you might recall, Galarraga almost threw a Perfect Game on June 2nd, but a bad call on the 27th out, blew it. Galarraga handled the adversity with Andre Dawson-esque class, and most people around the game conceded that he did indeed achieve a certain level of folk hero immortality. Tonight, Matt Garza threw 120 pitches, 80 for strikes, walked only one batter, and faced the minimum 27 batters by following that walk with a double play to end the 2nd inning. Yes, Matt Garza retired the last 22 batters he faced. It's a classic performance, and he deserves all the praise he'll receive. Part of me wonders, however, what was Armando Galarraga thinking as he watched the opposing Rays celebrating in a manner he couldn't?